I'm really excited about today's post as it kicks off a collaboration (lots of those happening lately!) I'm doing with some of the Southern Blog Society ladies that I connected with in Atlanta. As you know, we received an amazing gift bag full of products from equally amazing and blogger-supportive sponsors. 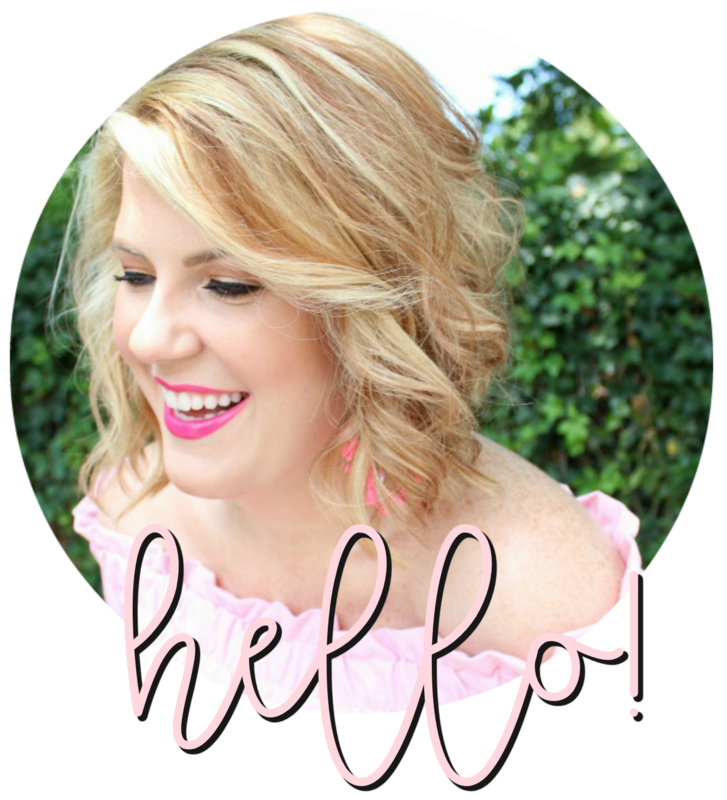 We decided to do a series of posts spotlighting some pieces from our bag and sing the praises of the sweet folks who love and support bloggers. First up in our series is this Paige denim jacket - which I'm pretty sure we all nearly died over. 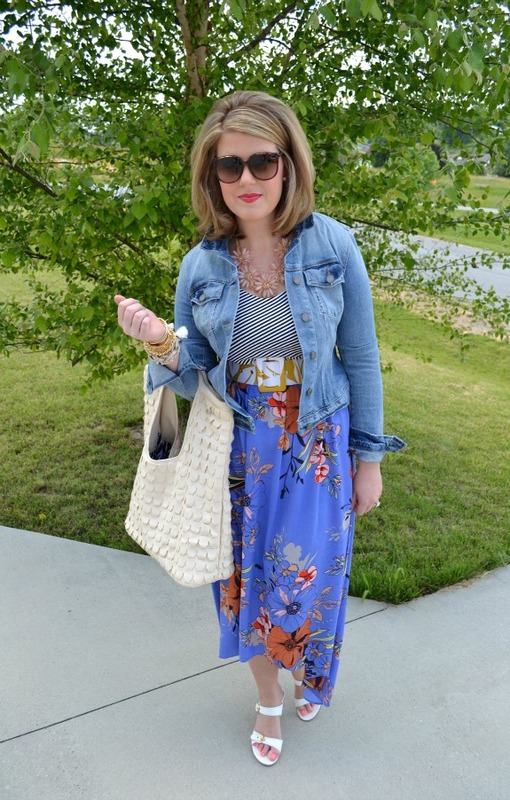 I put it over this dress from Anthropologie and gave it a little lift with some wicker wedges. Make the jacket yours here and scroll on to see how I styled it! Check out the other ladies' posts on their blogs! This is not a sponsored series. The brands we will be featuring are those that we truly love. Thank you for supporting the brands that make this blog possible (and a whole lot more fun!). Dying! LOVE that dress on you! I think I would've died over that jacket too! Loving this print! You look great! What a great combo. It goes awesome with that bold floral skirt! Obsessed with that dress! You look gorgeous, and I love how you styled the jacket! That skirt! You look great! You need to stop playing and give me that dress and belt! Love how you styled the jacket! What a lucky gift. There is nothing like a perfect jean jacket. This one looks really soft and comfy! AH! The Anthro maxi :))) Its perfect, I am so glad you got it! You look too freaking cute! 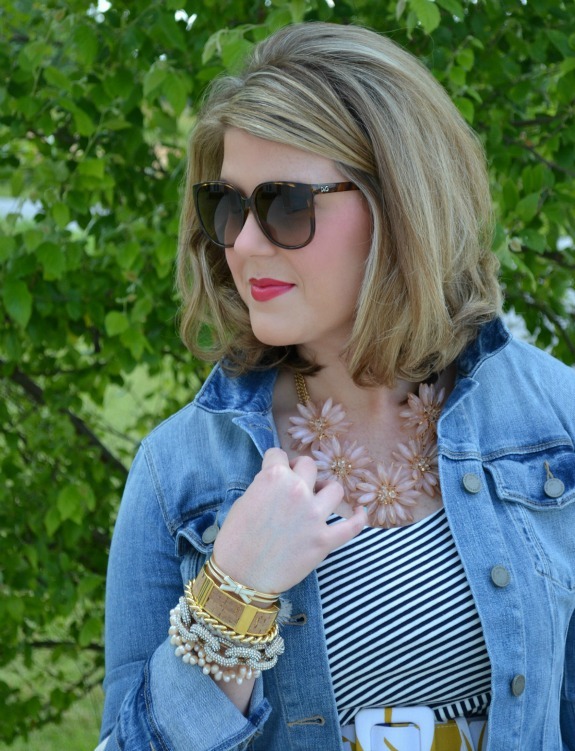 I love a good Jean jacket! Loving this look. Love everything about your look! Everything from the colors, prints, jewelry and hair! You look gorgeous as always in this! 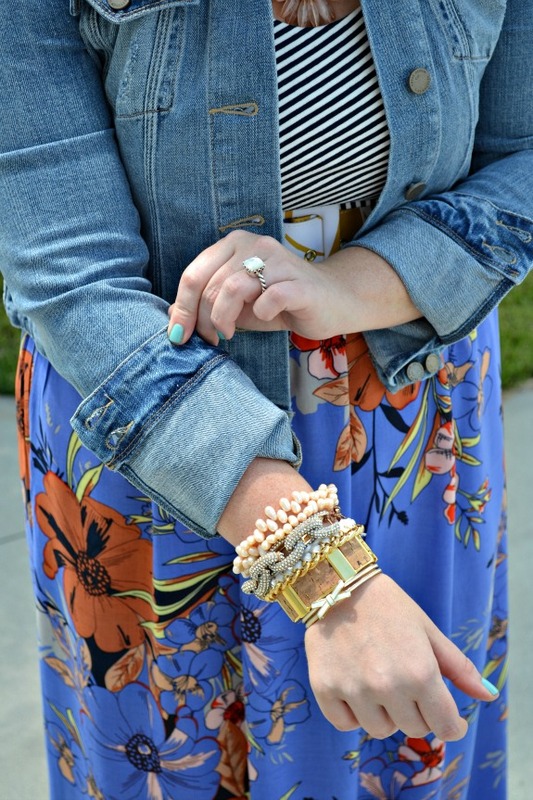 I really love the pairing of the jean jacket with the dress! (Which is another amazing piece.) I especially like how it incorporates floral and stripes in one. It is such a great mix on you! Plus, I love the colors on your toes and fingers :) Soo cute!